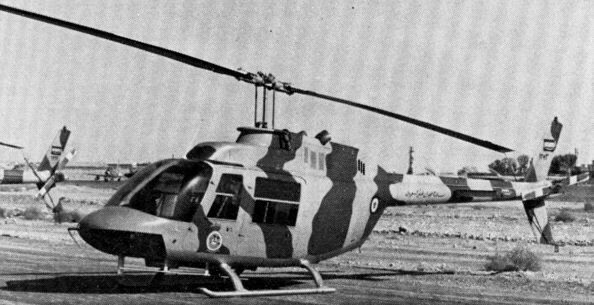 An Agusta-Bell AB 205 of the Royal Flight at Riyadh. One of the camouflaged Lockheed C-130E Hercules of No 16 Squadron which was the second RSAF unit to receive this redoubtable transport type which first entered the inventory in September 1965. 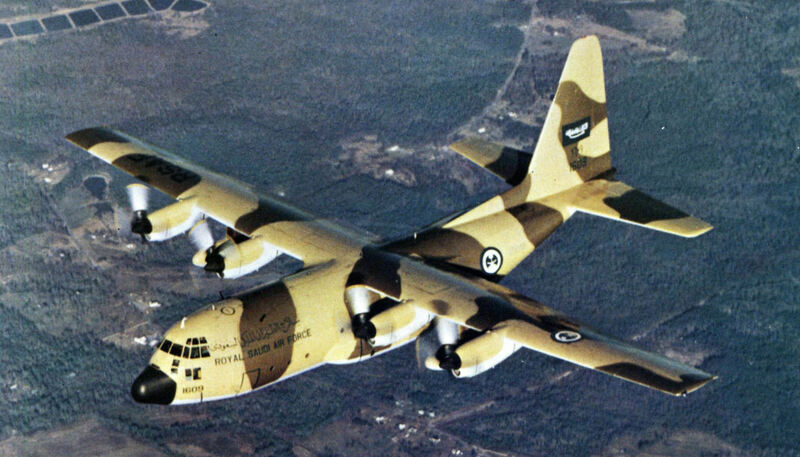 A Lockheed C-130E Hercules (1608) of No 16 Squadron which operates from Jedda with the similarly-equipped No 4 Squadron in the long-range transport role. A Lockheed T-33A (1510) is seen landing at Dhahran after completing a training mission. This type is to be replaced in the R Saudi AF inventory by the Northrop F-5Bs now on order. Three Lockheed T-33As of No 15 Squadron taking-off. This Squadron is based at Dhahran, and, together with Sabre-equipped No 7 Squadron, forms the RSAF's Operational Conversion Unit. 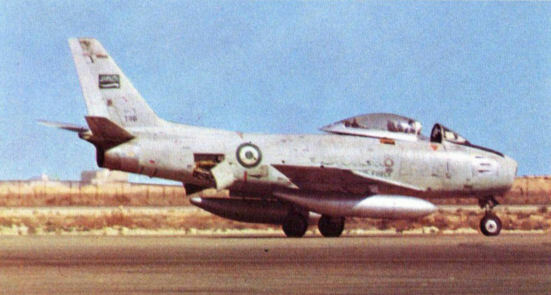 Lightning F Mk 53 (53-674) of No 2 Squadron seen taking-off from Dhahran on an armament practice sortie with twin Aden cannon, 2-in (5-cm) rocket pack aft of the nose-wheel, and 68-mm SNEB rocket pods beneath the wings. 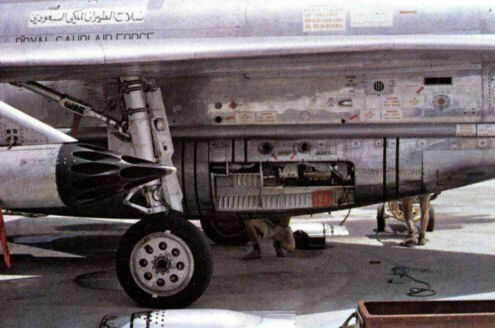 Lightning F Mk 53 (53-693) of the Lightning Conversion Unit seen on the flight line at Dhahran armed with two 1,000-lb (453,6-kg) practice bombs. The 30-mm Aden cannon installation of a Lightning F Mk 53 during re-arming at Dhahran. Lightning F Mk 53 (53-669) of the storage unit at Riyadh seen during ex-storage engine runs. A Lightning А Mk 53 (53-698) of the Lightning Conversion Unit taking-off at Riyadh during an RSAF cadet passing-out parade. 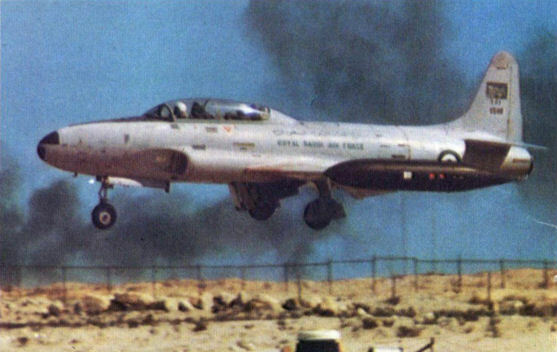 This aircraft is one of nine used in offensive action against Yemeni forces in December 1969 from Khamis Mushayt. A view of a maintenance hangar at Ryadh with Strikemaster Mk 80s, Cessna 172s, and Lightning F Mk 53s and T Mk 55s. The Lightings on the extreme right were in long-term storage at the time this photograph was taken. Strikemaster Mk 80s (901 and 902) currently serving with No 9 Squadron at Riyadh where they provide both basic flying training and initial weapons training. 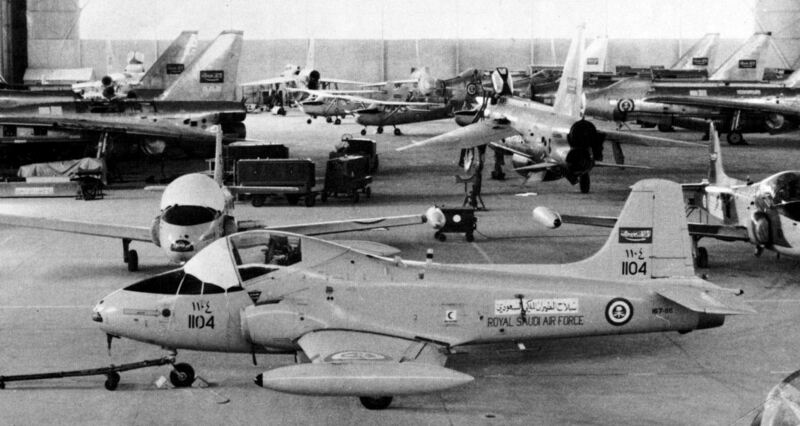 Strikemaster Mk 80 (1107) of No 11 Squadron of the King Faisal Air Academy at Riyadh. 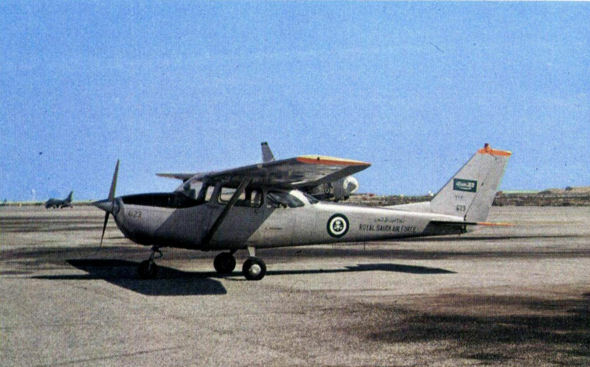 Cessna F.172G (623) of No 8 Squadron, King Faisal Air Academy, seen at Dhahran after a flight from Riyadh. 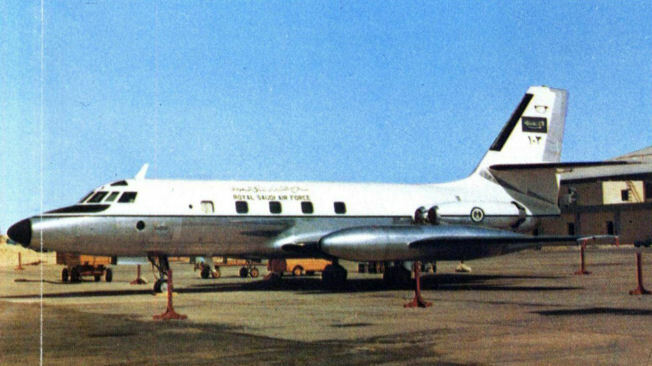 One of the two immaculate Lockheed JetStars (103) of the Royal Flight seen at Riyadh. Frequently used by governmental officials. the JetStars are serviced and flown by US personnel provided by the Lockheed company.